Dr. Srikanth Sola is a consultant cardiologist at the Sri Sathya Sai Institute of Higher Medical Sciences, Whitefield Bengaluru. Born in 1971 in Vijayawada, Andhra Pradesh, India, Dr. Sola’s family migrated to the USA when he was 5 years old and he grew up in a quiet part of the state of Kentucky. Today Dr. Sola is an internationally reputed cardiologist. He holds an array of professional credentials including MD, FACC and FAHA and has acquired these qualifications from the finest of institutions in the US. Dr. Sola completed his undergraduate studies at Stanford University, his residency training and intern in medicine at Duke University Medical Centre and fellowship in cardiology at Emory University School of Medicine, Atlanta. He then served as a staff cardiologist at the world famous Cleveland Clinic in the United States. Dr. Sola was named one of America’s top cardiologists by the consumer research council of America in 2006 and 2007, Who’s Who in Science and Engineering from 2005 to 2008 and Who’s Who in America from 2004 to 2008. Even as Dr. Sola was on top of his game, in 2008 Dr. Sola and his wife Shivani relocated to Bengaluru, India to serve Bhagawan Sri Sathya Sai Baba. Here is the transcript of the talk he delivered in the Sai Kulwant Hall on the morning of Guru Poornima Day on July 22, 2013. My humble pranams at the lotus feet of our Beloved Guru and Master Bhagawan Sri Sathya Sai Baba. Respected elders and dear brothers and sisters, my loving Sairams to each and every one of you. It is a pleasure to be here on this holy and auspicious occasion of Guru Poornima. As I stand here before you I am reminded of how I first came to Swami; it was a humorous incident that happened way back in 2008. I then moved from the United States to India. This was around Guru Poornima festival and I had just joined the Sri Sathya Sai Institute of Higher Medical Sciences, Whitefield as a Cardiologist.. as Swami’s Cardiologist. Swami just looked at me with a smile of amusement (no one says 'Sairam' to Swami!). Perhaps I was very naive at that time and certainly very simple in my approach to how I understood Swami. I guess in the time that has intervened I have matured a bit but my practice of Swami’s teachings is still very simple. What I would like to share with you this morning is one of these simple practices that I follow. 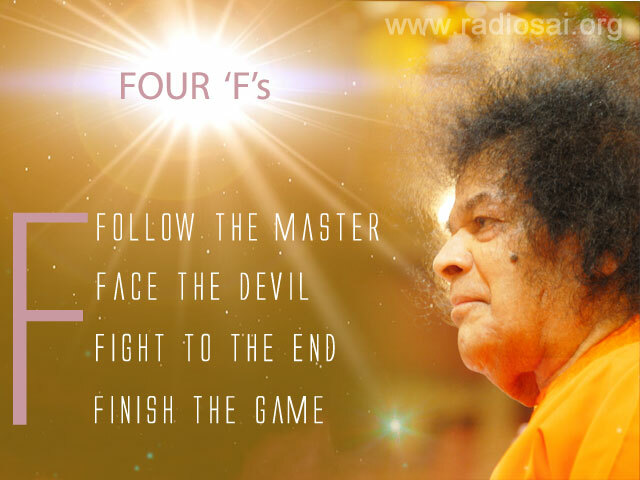 Swami has given us the four ‘F’s: Follow the Master, Face the devil, Fight to the end and Finish the Game. In my simple minded practice, I actually only follow one of these: Follow the Master. I will tell you what happens to the other three at the end of the talk. Follow the Master! Actually I have learnt this lesson by watching our students. 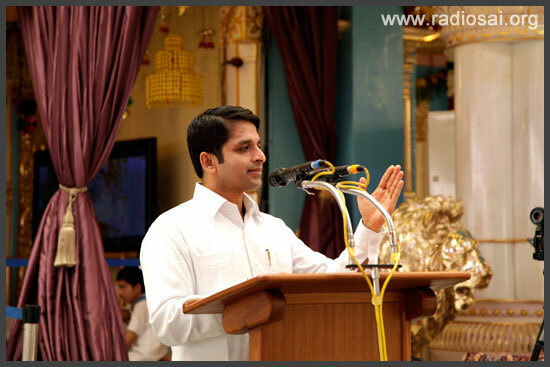 As Bhagawan sat before us on the dais, I would observe how Swami’s students would interact and relate with Swami. They were ever attentive, always alert to Swami’s slightest motion, always focused with one-pointed attention on everything that Swami did. Whenever Swami gave the slightest instruction, the mildest hint that He wished something to be done, they would run off immediately performing that task, and when the task was completed they would come back and again watch Swami with one-pointed attention. There are deep lessons in this simple practice for all of us. Just as these students who are always observant of Swami, ever ready, always alert and always obedient to the slightest hint for Swami’s wish and will, we can also do the same. So on this holy occasion of Guru Poornima, I wish to talk to you about following the Master. This is the only practice that I really know: Follow the Master. How do we do it? It is not enough just to talk. We can be like Swami’s students; but here we have to follow the inner Master, the inner Sai. We have to watch Him with the same one-pointed attention, that same extreme focus, looking inside of ourselves, watching, always alert, always ready, ever obedient to His Divine will in our lives. Do You Wish to Tame Your Mind? Love God! When I share this with devotees around the world, I find that devotees tend to fall in three different groups: children, adults and our young adults. Interestingly when I share this with children, they understand right away. It is simple for them. I just tell them and they say 'okay uncle' and practice right away. I am delighted to see that students from both of Swami’s primary schools are here. Children, you are the ones who should take this forward. You have to set the example. Follow the inner Master, follow the inner Sai. Be always alert, be always ready and be always obedient to Swami. But you know, Swami is very mischievous and He loves to play. So make this practice fun! Play the game with Swami, have fun with Swami: Follow the Master! When it comes to adults, I find something different. Adults are often led away; sometimes very far away by the monkey mind. The easiest way to tame this monkey mind is simply to love Swami and adore Him. Because when we love our Lord, we become immersed in our Lord. And when we become immersed in Him, we get absorbed by Him, and then the monkey mind vanishes. The second thing I find in adults is that we have to develop purity. We have to vanquish the six enemies – pride, lust, anger, greed and so on. Again the simplest way to do this is just through love – just contemplate and meditate on Swami’s pure, sweet, unconditional love. 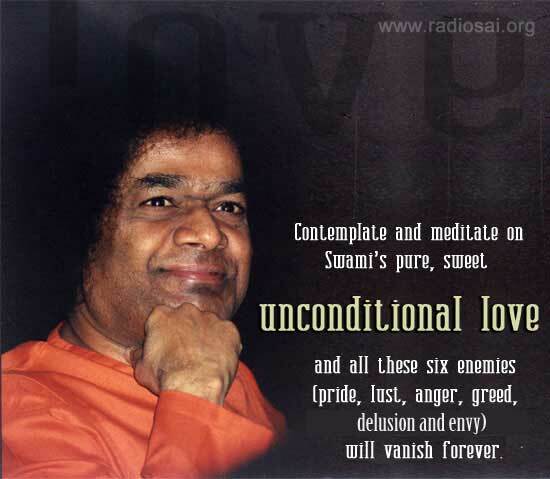 It is this love of Bhagawan that has drawn Him to us; it is this love of Swami that would purify us. Just contemplate on that love and all these six enemies will vanish forever. The third thing I find with adults is that sometimes they carry excess baggage. You see when our students are sitting before Bhagawan and Swami would ask them to do something, they would get up, run and then would come back and again sit silently. They would never proclaim what Swami had told them. They would just carry the work out silently without making any fuss. But when we carry excess baggage, it is difficult for us to run. It is difficult for us to be agile to follow Swami’s instructions. And this excess baggage is our emotional baggage – our resentments, our regrets, our sense of rejection – these we need to hand over to Swami because we don’t need this heavy weight any more. So when we purify ourselves, when we immerse ourselves in love and when we get rid of this excess weight, even we adults can follow the Master easily. There is this third group and this is the one that I find has the most difficulty in following the Master - our youth or young adults. Surprising! What they tell me is that it is fine for you to follow the Master sometimes; but what about us? We have to study, we have to work; we have to establish ourselves in our careers; we have to move forward. I have a family; I just had a child; I need to earn to support myself. Perhaps just as I was naive when I first came to Bhagawan as His physician and said 'Sai Ram' even to Swami Himself, these young adults likewise are also naive in thinking that somehow if we follow the Master, we will be relegated to a third class way of life. Brothers and sisters, this is absolutely incorrect. Let me give you some examples from my own life. Twenty years ago, when I was a medical student in the United States, I was physically far away from Swami. I did not have access to Bhagawan’s physical form. So I had to learn to connect to the inner Master, the inner Sai. And interestingly I find that twenty years later we are all in the same position, a beautiful position today. All medical students had to take the National Board Exams in order to pass out of medical school. Some of you may know this as the USMLE (United States Medical Licensing Examinations). I was so attuned to Swami in those days that He gave me the strength to study for sixteen, seventeen, or sometimes eighteen hours a day for months on end to prepare for this exam and when the time came actually to take the exam, I found that the answers flowed effortlessly. In fact it came so easily that I was able to answer everything during the course of the two day exam without any difficulty at all. Two weeks later when the results were announced I was surprised to find that not only had I received the highest score on these Board Exams in the history of my medical school, I had also received the highest score ever in the history of the exam itself. This is what happens when we follow the Master. But Swami made it very clear - a few days after all the congratulations from family and friends, classmates and professors had died down, Bhagawan appeared to me in a dream and with His finger raised He said, “You see, that was all My doing! Swami’s doing!” He told me, “There is no way you could have achieved that score on your own”. As you heard during the introduction, I went on to work at a hospital called the Cleveland Clinic which is regarded as the number one hospital for Cardiac care in the world. So let me give you my example. When we follow the Master, Swami will make you, not only number one in the country, He will also make you work in the number one institution in the world. He will make you the best that you can possibly be. But still there will be some doubts. Still there will be those who think that if we follow the Master we will somehow lag behind. Again this is incorrect. Let me give you some examples from Swami’s own hospital, simple and short instances. When we follow the Master, Bhagawan will bless us with all success. He will bless us with all fame and all wealth. I will give you three such examples. First, let us look at how Swami has blessed us with all success. 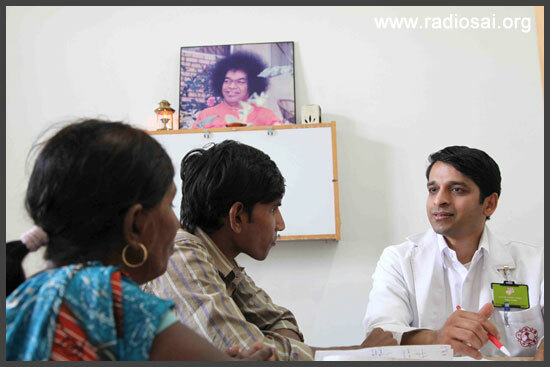 We doctors in Swami’s hospital, are not only physicians who take care of the patients but also are teachers to the next generation of physicians. They are called residents; they have completed their medical school and are completing their speciality training to become full-fledged physicians. At the end of their residency training, they have to take national level exams and these exams are very, very difficult. For every three residents who appear for this exam, only one will pass. It is a very difficult exam. At Swami’s institution we take this as a holy duty, as a sacred responsibility to train and mentor this next generation physicians, and so what do we do? We follow Swami’s examples; we follow Swami’s guidance and we follow the Master, attuning ourselves to Him so that we are constantly refining and updating our teaching programme so that the residents get the best possible experience. The result is that, whereas in the country, only 33% of the residents are passing these exams, at the Sri Sathya Sai Institute of Higher Medical Sciences, our success rate is not less than 100%. Let us look at the second gift from Swami – fame! We all know that Swami is the only hero and we are all just zeros. I will give you some examples from my own department – the Department of Cardiology. We at best see that fame is a distraction. We have no interest in this. But we know that Swami gives fame as part of the play. If you look at the senior faculty in our department, we find that they are so attuned to the Master that to be with them is similar to being with the Master Himself. Our junior faculty have risen so quickly by following the inner Swami that they have won two National level awards at various meetings. And as this fame, this word of our expertise and knowledge spreads, we find that we, our staff, are in such demand that when we look at medical conferences where physicians are educated, we are booked for every single major international and national conference, until the conference schedule ends in February of next year (2014). Such is the demand on Swami’s doctors. But not just His doctors; it is His institution, that sacred institution that He has formed. You see, we as doctors go to medical conferences. We not only expect to hear the expert physicians speak to us on the latest matter; we also want to see complex operations, difficult procedures being performed, so we can learn. So these are beamed into the conference venue from various hospitals around the world. The organising societies, senior physicians who lead the societies, will choose the hospitals, which have expert physicians and have access to a wide range of complex and difficult cases. Also those which have the latest technology and excellent infrastructure to support this type of activity. Swami’s hospital has all of these and what we are finding is that when these conferences are organised, these senior doctors are saying, 'I don’t care what it takes, I want Sathya Sai Hospital at our conference'. Let us look at the last gift of Swami: When we follow His teachings, Swami will bless us with all wealth. We just have to follow the Master. Recently I was part of a team. We were entrusted with the responsibility of purchasing new high end CT Scanners for both of the Super Speciality Hospitals. We had prepared a budget which was in rupees naturally, but the vendors which provide the CT Scanners, give their prices in dollars. Now, as many of you are aware, because of various external factors, the value of the rupee against the dollar has fallen by more than 20% in the recent months; whereas we had budgeted for certain level of CT scanner initially, we found that when we were actually ready to make the purchase, our budget was only able to allow us to purchase much less. Now here I must add that the Sri Sathya Sai Central Trust has been very progressive and very forward thinking in making sure that all of Swami’s hospitals are enabled and equipped with the latest technology and that we are functioning, exceeding the medical standards. But we have a sacred responsibility. Swami had told this: that every paisa that we spend has to be spent in the most responsible and efficient manner and so we take this duty very seriously. So we had a certain amount to work with and the difference for the very best of the best CT scanners was actually quite a bit; to the tune of more than Rs. 2.5 crores. We can actually perform 500 heart operations with this amount. That gives you the perspective of what we were thinking. Here I recall what Swami had done when the first Super Speciality Hospital was opened twenty years ago. When He was asked what type of CT scanner to purchase, Bhagawan simply answered – purchase the best CT scanner on the face of the earth and that was what was done. But now some time ago, we found ourselves in a different situation, and so what to do? What else should we do? Follow the Master! Going inside, we follow the Master, all of us – whether it was from finance, bio-medical engineering, cardiology or radiology. And at the end do you know what happened? The vendor which sells leading CT scanners came to us and said, "Look! We know that you are budgeting for this level of scanner – our mid-range scanner. But we very much want that our top-end scanners be there at both of your hospitals. Here is what we are going to do! We will give you both our very best scanners at the same price as the mid-range scanners that you are planning to buy." And so, Swami’s hospitals, both of the Super Speciality Hospitals would once again have the best CT scanners on the face of the planet. This is the wealth that Swami gives us when we follow the Master. Follow the Master; you will have all success; you will have all fame and you will have all wealth. But I know none of us are going to follow the Master for these things. This is worldly success. We follow the Master because we love the Master. We follow the Master because for us Swami’s love is our life breath. We know nothing else but to serve Swami. We want nothing else but to serve Swami. But when we follow the Master, Swami will give us all spiritual success as well. He will show you the truth. Bhagawan’s will is for you to know that you are SAI, that you are God and everything is God. And when you follow the Master this would become just as plain as day. When you follow the Master, there is no need to face the devil because the devil will disappear. When we follow the Master there is no need to fight to the end because all fighting will cease. When you follow the Master there is no need to finish the game because that game of duality would be finished itself. Brothers and sisters, on this holy and auspicious day of Guru Poornima, let us all dedicate ourselves to following our Divine Master. Let us all remain ever alert, ever ready and always obedient to His will.